Terry Herald's professional career has been spent exploring a breadth of musical idioms, from Renaissance through Contemporary, composing for a wide range of genres including chamber, chorale, and orchestral music, while incorporating jazz and world music influences in his works. He has served as music director for guitarist Earl Klugh as well as for flutist Alexander Zonjic, arranging, orchestrating and conducting for numerous concerts. His career as a composer began in film scoring and has evolved over the years into the orchestral/concert areas in which he now concentrates. He is currently exploring the genre of scoring for video games and his work was recently featured in the video at the Youmacon Convention highlighting all the new up and coming video games. 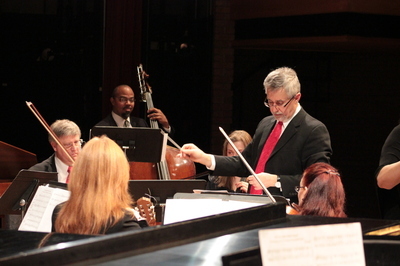 After earning Bachelor and Master Degrees from Wayne State University in music, Herald join the faculty of Wayne teaching a variety of courses including music theory, arranging and orchestration. He is currently on staff at Oakland University where he engineers all sound recordings in Varner Hall as well as teaches courses in the history of film music, sound recording, and accepts private composition students. He maintains a robust recording schedule at his studio in Oakland Twp. where he engineers recordings for artists needing a state of the art facility in which to record.